Taro is a starch-rich, globular fleshy taproot of aroid family plants. Its underground root, known as a corm, is one of the traditional edible root vegetables to a greater parts Asia, Pacific islands, West Africa, and Amazonian regions of South America. Some of the common names are cocoyam, dasheen, Colocasia, elephant’s ear plant, amadumbe, kalo, etc. Binomially, it belongs to the Araceae (aroid) family, in the large genus, Colocasia. Scientific name: Colocasia esculenta (L.) schott. Dasheen roots, popular as kalo in the Pacific islands. Taro is a large perennial herbaceous plant growing up to 5-6 feet. It's rather large heart-shaped, frilly edged leaves at the end of long, stout petioles appear like elephant’s ear. It grows best in marshy, wet soil and warm, humid climates. The corm grows to a size of a turnip, has globular or oblong shape with brown, tough skin. Its surface is marked by circular rings indicating points of attachment of scaly leaves. Inside, its flesh is white to cream-yellow but may feature different colors depending upon cultivar types. An average-size corm weighs about 2-4 pounds. It’s delicious, crispy-textured meat becomes soft and edible once cooked and has nutty flavor just as in water chestnuts. Yautia (Xanthosoma species), also known as tannia, malanga, etc., is similar to taro but smaller and has somewhat elongated, bumpy corms that are grown widely in East Asia, Caribbean and South American regions. Eddoe (Colocasia esculenta antiquorum) is also a smaller size corm with a irregular surface. It grows widely in India, China, and Japan as well as in some Caribbean countries. It is known as arbi in the Indian subcontinent. Taro or dasheen roots carry more calories than potatoes. 100 grams of root provides 112 calories. Their calorie value chiefly comes from complex carbohydrates, amylose, and amylopectin. However, they are minor source of fats and protein than in cereals and pulses. Their protein levels can be comparable to that of other tropical food sources like yam, cassava, potato, plantain, etc. The corms, however, are free from gluten protein. They carry high-quality phytonutrient profile comprising of dietary fiber, and antioxidants in addition to moderate proportions of minerals, and vitamins. Taro is one of the finest sources dietary fibers; 100 g flesh provides 4.1 g or 11% of daily requirement of dietary fiber. Together with slow digesting complex carbohydrates, moderate amounts of fiber in the food help gradual rise in blood sugar levels. Yellow-fleshed roots and young, tender leaves have significant levels of phenolic flavonoid pigment antioxidants such as ß-carotenes, and cryptoxanthin along with vitamin-A. 100 g fresh taro leaves provide 4825 IU or 161% of RDA of vitamin-A. Altogether, these compounds are required for maintaining healthy mucosa, skin, and vision. Consumption of natural foods rich in flavonoids helps protect from lung and oral cavity cancers. Further, the corms provide healthy amounts of some of the essential minerals like zinc, magnesium, copper, iron, and manganese. Besides, the root has good amounts of potassium. Potassium is an essential component of cell and body fluids that help regulate heart rate and blood pressure. To harvest, the whole plant is pulled off the ground, about 8-10 months after plantation when its leaves begin to turn yellow. In the tropics, fresh corms can be readily available in the markets. In fact, taro has a cultural identification with many Asia-pacific societies. Each year Hawaiian celebrates annual taro food festival in April when their children learn to pound corms to make poi (a kind of taro paste). Farmers carry their fresh harvest to gift friends and relatives. Cleaned, and processed taro corms can be available in the US markets usually imported from the Pacific islands. Buy fresh, firm, medium size hairy corms that feel heavy in hand for their size. Avoid those with soft spots, cracks, or featuring sprouts at the scales. Fresh corms should be stored in cool, dark, well-ventilated place as in potato, yams, etc. Do not keep them inside the refrigerator, as they would sustain chilling injury. Taro greens, however, should be placed in the refrigerator and used as in a way like other greens. Taro corms and leaves should be processed and boiled before eating as they can be unpleasantly bitter and harmful for health when eaten raw. 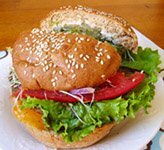 However, the plant parts are very safe after cooked (boiling, frying, steaming, etc.). To prepare, wash the corm, trim the ends, peel away its outer tough hairy skin using a paring knife. Place its white interior flesh in cold water to remove sticky sap. The corm taro can be used in a variety of preparations. In Hawaii, boiled root is ground into a sticky paste known as poi. Kaulau, a traditional Polynesian coconut pudding dessert in which, boiled dasheen is mixed with coconut milk and brown sugar. The corms are also employed in the preparations of burger, bread, flakes, pancakes, muffin, chips, flour, cookie, ice cream, etc. Taro leaves used in soups, pakora (known as pathrode in some parts of coastal South India). All of the taro plant parts including corms contain oxalic acid which renders them acrid. Fortunately, however, this chemical is entirely destroyed in cooking. Cooked taro is safe for human consumption. (Medical-disclaimer). 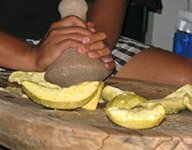 <<-Also read- Malanga (yautia) nutrition facts and health benefits. <<-Back to Vegetables from Taro nutrition. Visit here for an impressive list of vegetables with complete illustrations of their nutrition facts and health benefits.